Samsung Galaxy Note 9 and iPhone XS Max – Two Awesome, Beautiful, Huge Smartphones! It is natural to compare the new iPhone XS Max with the recently released Samsung Galaxy Note 9, as they are the two flagship phones from the two most important smartphone companies in the world. As I said, you can find these all over the media right now … but in my opinion, they are completely useless. Why? – The Samsung Galaxy Note 9 is the best Android phone I have ever used, with a gorgeous screen, loads of power, and the amazing S-Pen. There are also annoyances I have with it, as no device is perfect. It is a great device, and I use it every day. – The Apple iPhone XS Max is the best iPhone I have ever used. It is incredibly powerful and responsive, has a gorgeous screen and feels deceptively small for such a huge device. Despite using the S-Pen on my Samsung every day, I have never wished for stylus support on my iPhone – it is just different. It is a great device, and I use it every day. 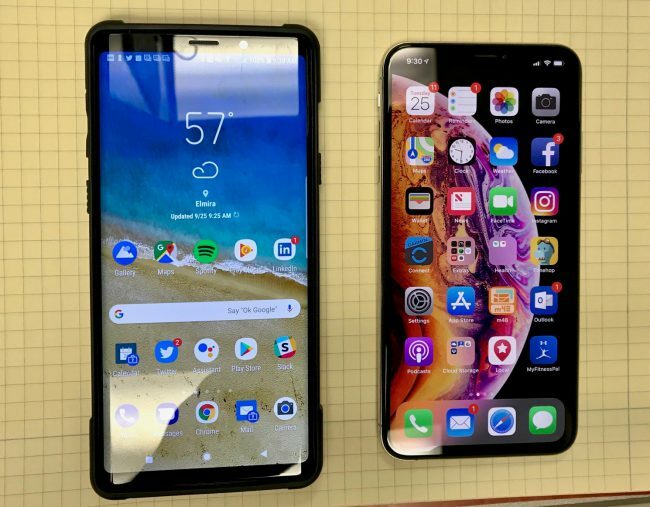 As the picture shows, the Note is taller than the iPhone even without factoring in the case – and you can’t see that it is also thicker. Otherwise, the phones are similarly large, similarly powerful – and similarly expensive. These are both fantastic devices that could replace most of your computer needs and easily last you a few years before needing an upgrade.